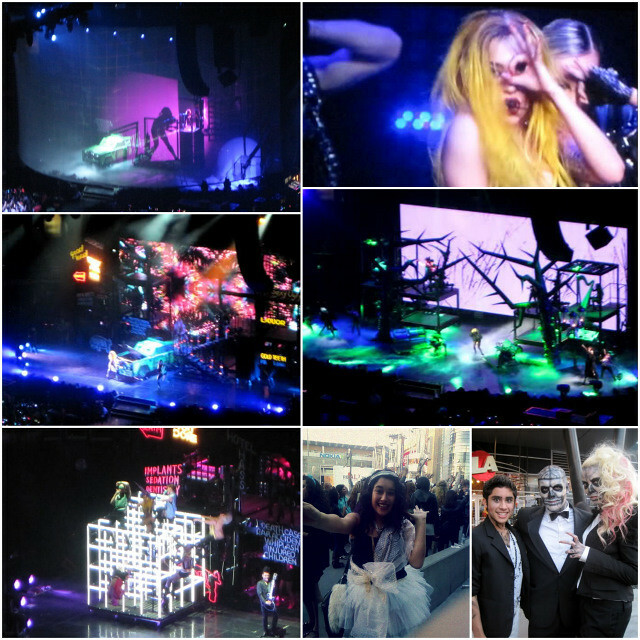 On March 28th Ryan Vasquez and I got the wonderful opportunity to see Lady Gaga at the Staples Center in Los Angeles. We couldn’t believe our luck that we were seeing one of our favorite artists (and Ryan’s number one obsession), but the fact that we saw her on her very own birthday was the cherry on top! Our trip got off to a rather bumpy start once Ryan realized he had forgotten the tickets just as we were approaching Goleta! But as soon as we quickly fetched them back in SLO and hit the road again we were even more excited! We rapidly got dressed in our outfits and after a few sessions of body-paint-splattering we left for the Staples Center. At the entrance there were hundreds of people dressed in the craziest outfits and many paparazzi and news casters! After entering the stadium and taking our seats the show began after an intro by Lady GaGa’s friends The Scissor Sisters. Once they were done everyone screamed as Mother Monster’s silhouette covered the stage. The whole performance was phenomenal and she even vowed to us that she never lip singed. Our favorite part was when she shared a birthday gift with us; she told us about receiving a pair of an original pair of ruby red slippers from the Wizard of Oz film! She gave an inspiring speech about trying out for the part of Dorothy as a young girl but a bully stole the spot, but she celebrated and was grateful that now she was the one with the slippers. It was a ten out of ten show and I wish it never ended!